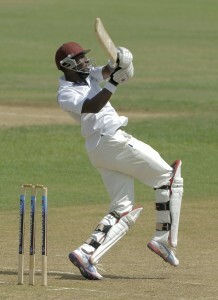 Raymon Reifer pulls to the boundary during his half- century today. Combined Campuses and Colleges were 333 for six off 133 overs in their second innings – an overall lead of 270 – at the close of play on the third day of the fourth round regional first-class match against the Leeward Islands at 3Ws Oval today. At the close Chadwick Walton was unbeaten on 74 and fast bowler Kevin McClean on one. Walton has so far struck seven fours and three sixes. His fifty came up in 82 minutes off 60 balls and included six fours and two sixes. The CCC started the day on 73 for two and benefited from a number of enterprising innings. Left-hander Anthony Alleyne played attractively in making 71 before he was leg before wicket by leg-spinner Anthony Martin. He had started the day on 34 and was dismissed in the 84th over to leave the CCC on 148 for 3. Alleyne batted for 279 minutes, faced 262 balls and struck six fours. He reached his fifty in 163 minutes off 165 balls with three boundaries. The highly talented all-rounder Raymon Reifer caught the eye during his stay at the wicket after resuming from an overnight 17. He fell 15 short of a well deserved century when he was also leg before wicket by Martin for 85. He was out in the 100th over with the score on 195 for 4. Reifer’s innings lasted 289 minutes. He received 261 balls and hit nine boundaries. Veteran batsman Floyd Reifer also batted with enterprise for his 48 before he also went by the leg before wicket route as well, but this time to medium-pacer Tonito Willett.